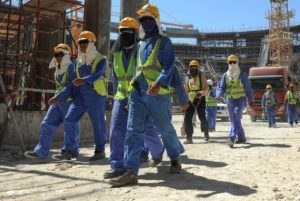 The organizing committee of FIFA World Cup 2022 has announced payment of $5.2 million in compensation to thousands of foreign workers building stadiums and facilities to host the global football event. The move is part of reforms agreed upon with the International Labor Organization (ILO) in response to grievances over concerns that most workers from South Asian nations work under inhuman conditions with reports of several deaths. The $5.2 million amount will be paid over the next two years to the 20,000 workers from various countries including India and Nepal. “All too often, the very people who have left their homes to provide for their families are the ones exploited,” said organizing committee secretary general Hassan Al Thawadi. The workers will be reimbursed for the hardships they may have endured when coming to Qatar to work, Al Thawadi noted. The tiny country also agreed with ILO on several other issues including clamping down on passport confiscation by employers, making it easier for workers to switch jobs and the introduction of a minimum wage, reports say. The Gulf country is reportedly spending around $500 million every week on preparing the event to take place for the first time in the Arab world.